Their findings were published online Nov. 10 by the journal Nature Neuroscience. The disorder, which is caused by a genetic mutation, can disrupt a child’s development in many ways. It often causes unusual facial features, short stature, heart defects and developmental delays, including learning disabilities. No treatment is currently available. While many genes contribute to Noonan syndrome, there is one gene that causes about half of all cases. This gene encodes for a protein that regulates another protein called Ras, which controls how brain cells talk to each other, enabling learning to take place. 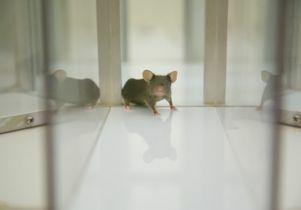 Working with first author Young-Seok Lee, Silva studied mice that were genetically engineered to develop Noonan syndrome. They discovered that the predominant mutation that leads to Noonan creates hyperactive Ras, which disrupts cellular conversations and undermines the learning process. Drawing upon Silva’s previous research on neurofibromatosis 1, another Ras-influenced disease, the UCLA team treated the mice with lovastatin, an FDA-approved statin drug currently in wide clinical use. Statin drugs lower cholesterol by blocking the synthesis of certain fat molecules — the same fat molecules that Ras requires to function. The resulting drop in Ras activity allowed the mice’s brain cells to communicate properly, enabling normal learning to take place. When adult mice with Noonan were treated with lovastatin in the UCLA study, the drop in Ras activity dramatically improved their memory and ability to remember objects and navigate mazes. According to Silva, UCLA’s approach could help the estimated 35 million Americans who struggle with learning disabilities. The next step will be to bring the drug therapy into clinical studies for Noonan. For details about trial locations, contact the Rasopathies Network. The research was supported by grants from the National Institute of Mental Health. The study’s UCLA coauthors were Dan Ehninger, Miou Zhou, Ying Cai, J. Balaji and Yoshitake Sano.